The new CWI intranet holds all the internal communication like practical information, specific forms, agenda’s, meetings, actual news, disturbances etc. Also relevant external information is presented within the intranet. A huge amount of information connected to the CWI databases within an easy to use and straightforward “library” design with a focus on usability for the CWI employees. 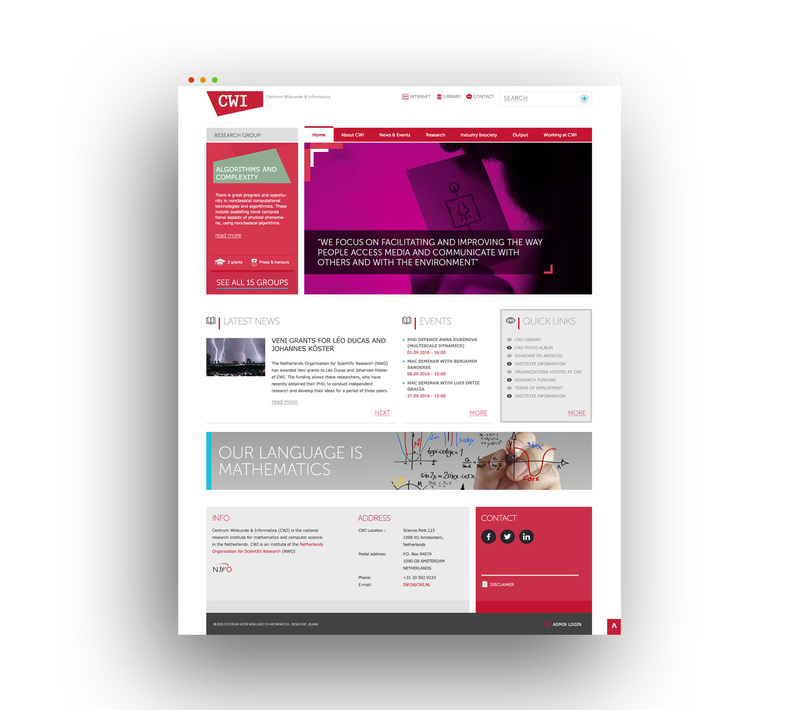 CWI (Centrum Wiskunde & Informatica) is the Netherlands’ national research institute for mathematics and computer science. We focused with the new CWI website on the visibility and the output of the core of the organization: the fifteen research groups. The heart of CWI. These research groups are presenting themselves to show their contribution to advanced systems. In other words: In the world of fast-moving technology these research groups deliver innovative ideas and mathematical concepts to solve complex problems or practical uses. Hereby showing all the necessary information, news and projects of the large organization within the new website.